When the Shakespeare Memorial Theatre opened in 1879 it was designed to be both a memorial to Shakespeare and a living breathing theatre. Among the original features of the building were a number of references to Shakespeare’s works: the Seven Ages of Man stained glass windows, a quotation from A Midsummer Night’s Dream which ran around the ceiling of the original theatre. 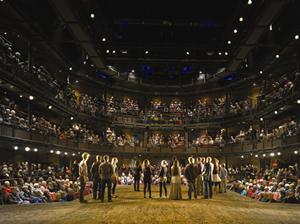 But the idea of remembering the history of Shakespeare’s plays in performance was also built in. A Picture Gallery and Library wing which would include paintings, books and the records of the theatre’s own productions, was there from the start. These items recalled past productions, some going back a hundred years, and new works of art and records were created and added to the theatre’s collections to be enjoyed by visitors. The theatre’s history became embedded in the building itself. Stained glass windows, sculptures and plaques dedicated to a whole range of people who had worked there were added to the building. Many of these survived the 1926 fire that destroyed the theatre itself and more were incorporated into the 1932 building. No wonder that directors, trying to breathe life into four-hundred-year old plays have sometimes found the weight of history overwhelming. 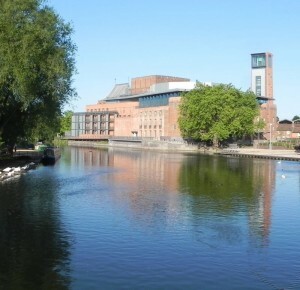 When it was suggested, ten or so years ago, that the Royal Shakespeare Theatre (the 1932 building) should be demolished to build a new theatre in its place, there was an outcry. Audiences felt that the building and the memories it held belonged to them as much as it did to the people who worked there, perhaps more. It’s a difficult balancing act for any theatre, attracting new audiences while not alienating those people who have supported them through thick and thin. On reassessing the redevelopment it was quickly decided that elements of the old building should be retained: not just the best of the design features like the spiral staircase and the Art Deco foyer but the proscenium arch (held responsible for some of the theatre’s problems) and, most sentimental of all, the original boards which made up the stage and had been trodden upon by generations of actors. These have been relaid in the new foyer areas so audiences can step on them. The historic features of the building are key elements of the tours offered to visitors to the building. The re-opening of the RST in November 2010 gave the company “A Janus moment” when they could look both forward and back. 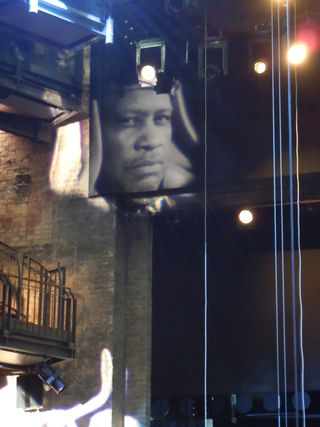 An installation called Ghosts in the Walls, curated by Gregory Doran, took archive material including images, photographs and sound recordings of famous moments from the theatre’s history and projected them onto the original back wall of the auditorium. Many people reading this post will have strong memories of performances of Shakespeare’s plays. Would you like to help to ensure those productions aren’t forgotten? I’m planning a project to gather and record audience recollections. My post on this subject has just appeared on the MyShakespeare blog, and if you would like to find out more please leave a message on the Listening to the Audience page of The Shakespeare blog. This entry was posted in Legacy, Shakespeare on Stage, Stratford-upon-Avon and tagged Ghosts in the Walls, memory, Royal Shakespeare Theatre, Shakespeare Memorial Theatre. Bookmark the permalink.